YART Yamaha wound up the 24 Heures Motos tests on a very encouraging note. The factory-backed Austrian team was the only one to complete a lap of the Bugatti circuit in under 1’37. Nearly all the teams entered for the second round of the FIM EWC championship in Le Mans on 21 and 22 April showed up for the two days of testing – a final opportunity for an all-round review before the 24 Heures Motos, with teams revealing some new aces up their sleeves. After a rainy first day dominated by Japanese squad F.C.C. TSR Honda France, on the second day YART Yamaha wound up the proceedings in style with a 1’36.867 lap. 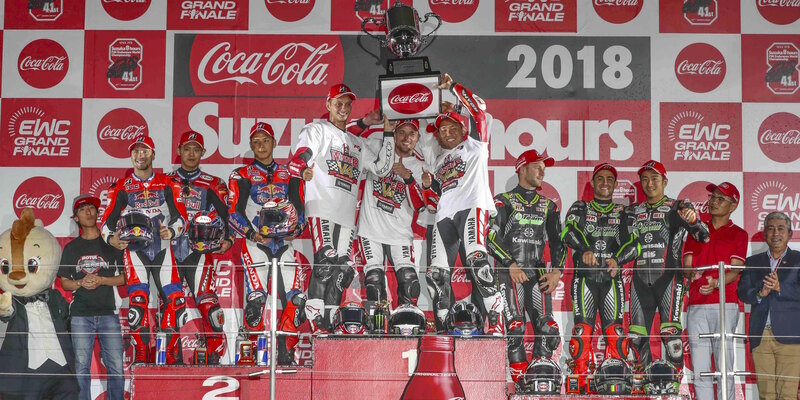 The Austrian team boasts two new assets that could swing it the win: the arrival of Max Neukirchner as race director and of young Japanese Superbike rider Takuya Fujita, who turned in an excellent performance on the Bugatti circuit alongside Marvin Fritz. YART Yamaha was quicker than Team NRT 48-BMW Motorrad (1’38.586), which stepped into the ranks of the favourites. The (newly factory backed) BMW team had picked up 4th place at the 2017 Bol d’Or. Another BMW-mounted squad, Team Tecmas, clocked a 1’38.824 lap, ahead of Honda Endurance Racing (1’39.159) and F.C.C. TSR Honda France (1’39.426). Junior Team Le Mans Sud Suzuki (1’39.723) was the fastest Superstock of the tests, coming in ahead of Team SRC Kawasaki and Suzuki Endurance Racing Team, which both opted to use the tests to fine-tune their bike settings and tyre choices. Team April Moto Motors Events, which returned to the track with a new Suzuki, and Team R2CL rounded off the Top 10 of the two days of Le Mans tests. The first day, on wet track, reigning world champion and 2017 Bol d’Or winner GMT94 Yamaha posted the third-fastest time, thereby confirming its goal of a fresh win. The two days of testing shifted the spotlight to two new factors that may well be decisive for the 24 Heures Motos win. The BMWs are looking increasingly likely candidates to win. And Bridgestone has won itself a place among endurance racing’s heavyweight manufacturers. Bridgestone is the tyre supplier for YART Yamaha, F.C.C. TSR Honda France and Mercury Racing, among others. All three teams turned in impressive performances in both dry and wet track conditions.